Creative IT has made a distinctive mark in the laptop repair industry for providing reliable, outstanding and timely ATI graphics repair services. Our skilled technicians and engineers who work in tune with the profound infrastructural system offers a wide range of services to guarantee your laptop and notebook computer’s video and picture clarity. Have you been using your laptop computer for more than 18 months? Is there no video on the screen? Does it have booting issues? If you have answered yes for any of these questions, then don’t delay in correcting these issues by getting it checked and resolved by a professional service provider. Are you experiencing a GPU (graphics processing unit) fault that is affecting the performance of your laptop? The problem possibly may be due to a weak die or packaging material set that was used, which may fail due to temperature fluctuations of the GPU chip. 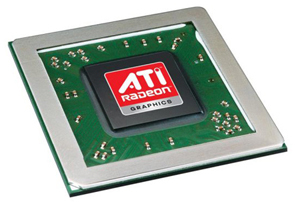 Get in touch with Creative IT laptop repair store, if you consider you may require an ATI graphics card repair or ATI GPU (graphics processing unit) repair service. You can also contact us if you are going through any of the video and graphics card related issues mentioned above and to discuss your exact laptop video card and graphics processing unit problems with one of our ATI GPU repair and replacement specialists. Creative IT offers customers several ATI graphics repair options to choose from such as reflow and Ball Grid Array (BGA) reballing, with the added benefit that these services are backed by a 90 day back to base warranty. We can also straightforwardly replace your faulty video card or GPU chip with a brand new one. Our team of technicians has good knowledge of component level laptop repairs and can effectively perform laptop video card and graphic card repair and replacement services for all leading laptop and notebook computer brands like HP, Compaq, Lenovo, Asus, Apple Mac, Fujitsu, Gateway, Acer, Samsung, Sony, Dell and Alienware. So get ready to enjoy a gaming or video experience that you always longed for? If you experience laptop video or graphics issues, contact Creative IT on 020 7064 4999 (Monday through Saturday from 9 am to 6 pm) or just bring your affected laptop or notebook computer to our Central London laptop repair store at 80 Willow Walk, The Willows, Unit 1, London SE1 5SY to find out the various ATI graphics repair and replacement services and support options available. 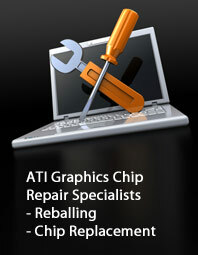 We also promptly respond to your laptop video card and graphic card repair queries send through info@atigraphiccardrepair.com. No prior appointment is necessary.